What do you think of when the miniature nation of New Zealand comes to mind? Flightless national birds? Long plane rides? “Business Time?” It’s unlikely that style-defyingly brilliant alt-rock comes to mind. Aukland’s Decortica just might change that. The trio plays a distinctive strain of rock music that sprawls itself out across the borders of genre constraint and invites you to join it. This past summer the group released their second album, Love Hotel, a work that conceptually takes its listener places few if any records actually do (http://en.wikipedia.org/wiki/Love_hotel). I recently was fortunate enough to skype it out with Decortica’s vocalist and guitarist, Mathew Bosher. The time difference required us to bust out some tricky elementary school math skills, but, needless to say, we knowz how to ad rul gud. BS: Hey Mat. How’s it- goin’? MB: Not bad ... thanks (laughs). BS: Decortica has been around for a little while now. I noticed that you put out your debut album in 2008, but just from listening to your latest release, Love Hotel, it sounds like you’ve continued to grow quite a bit as a unit. Could you say a little bit about your formation and where you’ve gone since then? MB: Sure. We’ve been operating for about five years and in the early days, as with any band, we were working through the bulk of material we were writing as young people- and there was a lot of it. The New Aesthetic [Decortica’s first album] was really sort of the best of the material that we felt would work well as a cohesive unit in an album format. So, soon after we had pretty clear ideas about, “okay now we’ve gone through the studio experience, we’ve been gigging for a while, and we’d like our next album to be a statement, with regard to production levels, the type of songs we wanted to write and also the level of craftsmanship.” So, the idea of doing a still alternative, but slightly more progressive rock concept album was really exciting. It’s a feeling of natural evolution. BS: The concept of Love Hotel is fairly unique you might say. What inspired you to write a collection of songs about these Japanese “love” hotels? MB: I think firstly I was interested in the themes of escapism and fantasy and so on. The hotel setting in general I thought was quite an interesting backdrop for those themes because of the anonymity and, as I started to think about this more and just do a little more reading on the subject, love hotels became apparent to me. So I delved pretty deeply into that research which was anything from fiction of native Japanese and foreign writers of that territory through to the anthropology books and what not. The fascination just grew to a point where I could see that we could sort of have this theatrical presentation in the form of a rock album. It was just interesting; I thought about this over the past few months actually, “when did I first become aware of it?" It might have been in conversation with people, you know, even listening to the BBC World Service at some point I think I picked up on something being mentioned about it. As soon as you start to become aware of an idea, all of these resources become available to you. I absolutely loved the investigative part, to understand more about it, as much as I did writing the album. BS: Was any of the lyrical content, perhaps, drawn from personal experience? MB: (laughs) I would love to go to love hotel, don’t get me wrong, but it is still very much an album from the perspective of the outside looking in. It’s pretty abstract and the voices that are in their are of the characters, not me, and it’s sort of a continuous narrative as well, that’s very observational. There’s certainly no criticism or anything like that; it’s just an interesting space to go into musically and also thematically. BS: Not even taking lyrics into account, it seems to me that there really is a kind of narrative or progression at work on Love Hotel. “Shinkansen” (I’m probably slaughtering the pronunciation of that) seems to have a lighter, almost upbeat vibe to it, but by the time we get to “The Sadness of Men” and my favorite song, which is the title track, an overwhelming bleakness seems to settle over the record. What was the rationale behind this story? MB: The “Shinkansen” track is titled because it’s delivering the listener to the Tokyo nightlife and ultimately to the love hotel experience [Shinkansen are high speed “bullet” trains used for travel in Japan]. With the idea of speed and dynamism in mind, that track kicks off immediately; the whole band comes in at the same time. I tried to get that feeling of immediacy so you sort of felt like you’re on this metaphysical ride into this spectacular sort of fantastical underworld experience. By the time you get into “Eros” and “Monster in a Pretty Dress,” the sort of carnal implications of the setting are becoming apparent. In “Ennui” we’re really talking about the escapism element and the characters who use that, I guess, “social function,” to deal with the balance of their life which might be that they’re entirely overworked and not just the cliché salary man character, but also the young people who have no other space to be together because their home environment doesn’t allow for that. Ennui was probably the genesis of the album, actually, because I think we can all identify with some shades of melancholy or ennui at some stage of life. “Love Hotel,” the track, is really the reprise where the listener or the characters have had the experience and they’ll be going back out into the world. It’s a very pretty track, but it is quite melancholy in its own right. Hopefully it's left the person feeling that they’ve had a complete run of emotional experience. BS: One of the things that really struck me about Decortica’s sound on this album was the way in which the music really suited the light and darkness present in theme. There is an almost constant balance in the work between the brighter vocal and guitar melodies and these gnarly sludgy riffs that lurk in the background. MB: I love riffs, man. Guitar is my first instrument and I love playing it, but sometimes it’s a real battle to marry the two responsibilities together of vocals and guitar. Ultimately, I’m motivated to keep it interesting and contrasted. Dissonance is the goal (laughs). Decortica's first single off Love Hotel, "Monster in a Pretty Dress"
BS: Another thing I noticed is that you made Love Hotel available for free download. A lot of bands have recently picked up on this trend that was, perhaps, spearheaded by Radiohead. What was the idea behind this approach? MB: Well, Radiohead did “pay what you want” which was really interesting because it raises the question of what the value of an album is to the fan. In our experience, while a lot of people took up the free offer, which is wonderful; that’s exactly what we wanted for people; ultimately to enjoy the record, many people paid much more than the asking price if they did want to purchase the deluxe version of the album, which had expanded content, but was still at a pretty low asking price anyway. The real motivation for doing that is we’re an unsigned band currently and I totally appreciate the freemium model as something that is very powerful in promoting artists. We wanted to really get the record out there because it was a product we felt very passionate about and it was an easy way to garner a lot of interest in it really. We knew that at the stage we were at that we were better to give away our music for free and capitalize on more people coming to our shows and investing their cash in things like exclusive content and really interesting, cool merch in order to support the band. The recent tour we did around New Zealand, that we did towards the end of last year, was successful I think because of the angle we took in marketing the record. BS: That's great. Americans, as of recent, have gotten a bit savvier with the work of international artists. One area that has received a lot of attention as far as alternative rock goes, whatever that means now days, is Australia. With groups like Karnivool, The Butterfly Effect, and Cog gaining further recognition, it makes me wonder where New Zealand sits in this international arena. Decortica is really the first serious band I’ve heard from New Zealand and I don’t mean that at all in a demeaning sense. For however much I love Flight of the Conchords, I’m not sure they fully represent all New Zealand has to offer as far as a scene. MB: With regard to alternative music I think there are definitely a few more outlets available to Australian-based bands. You know, the New Zealand [alternative] scene; that makes up a small component of our musical landscape, but there are a number of really good, inspired bands here. Australia is really just that much bigger and has that much more infrastructure from the venue level up to radio support for alternative music, which is fantastic. Part of our goal is to get into that space more and we did a trip into Melbourne last year and our style of music in performance was very well received. Hopefully we’re doing our best to champion the sort of genres we operate in for New Zealand. BS: Then I guess I won’t ask the next question which was in reference to the credibility of the whole New Zealand/Australia rivalry. I’m sorry to keep returning to Flight of the Conchords, but they made that out to be quite the sore subject. BS: Well that’s good to hear. I knew those wallabies weren’t so bad after all! In closing, what do you forsee in Decortica’s near future and what can the world expect see from you? MB: Well, a lot more shows this year, locally and abroad. Basically, we’ve got our sights set on an international scene now and we keep working every day towards that and building up the relationships that we need to make that happen. Concurrently, we’ve started to write album number three and have been for a while. So we’ve been really busy, although it looks like on the back of Love Hotel we’ll still be doing a lot of stuff for some months to come. Hopefully it wont be too long before album three is out. BS: I’m definitely looking forward to that. It’s been great talking to you, man. Is there anything else you’d like to add? MB: I would just like to make a shout out and say thanks to everyone who has supported us in any way and everyone; have a great year. Hopefully we’ll see much more of you. 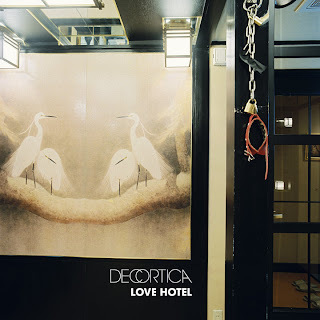 To stream Decortica's new album, Love Hotel, and download or purchase it for the price of your choosing (well worth your $2 or more) visit http://www.decortica.com/. And Tomorrow's Weather Will Be ... SO COLD.